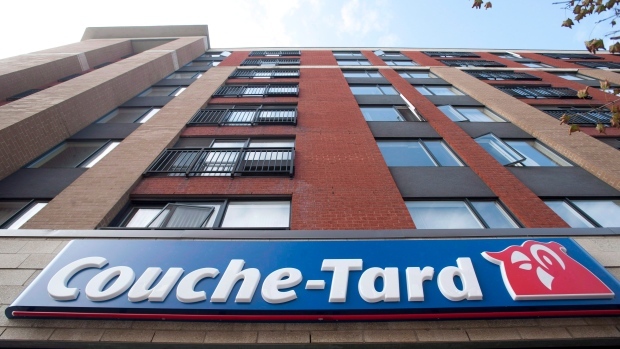 LAVAL, QUEBEC — Alimentation Couche-Tard Inc. (ATDb.TO) is boosting is quarterly dividend by 25 per cent after posting record third-quarter earnings that missed analyst expectations. The Quebec-based convenience store operator says its quarterly payout will increase to 12.5 cents per share from 10 cents per share, payable April 11 to shareholders on record as of March 28. Net profits attributable to shareholders for the period ending Feb. 3 increased 27 per cent to US$612.1 million from US$482.4 million a year earlier. The higher earnings were driven by higher U.S. fuel margins, internal growth and acquisitions. They were partially offset by a higher income tax rate and the negative impact from the translation of currency in Canada and Europe to U.S. dollars. Couche-Tard CEO Brian Hannasch said falling costs and the structure of some of its larger fuel agreements, along with U.S. volume growth, helped fuel results. "In Canada, we continued to improve the trend in same-store transportation fuel volumes, especially at the Esso sites where the newly implemented loyalty program is gaining traction," he said in a statement after markets closed. The company will discuss the results with analysts Wednesday morning. The results benefited from a US$3.2 million pre-tax gain from the sale of its marine fuel business while the year-ago results were affected by a net tax benefit of US$218.6 million due to U.S. tax cuts. Excluding one-time items, Couche-Tard, which reports in U.S. dollars, says adjusted profits reached $609 million or $1.08 per diluted share. That compared with $301 million or 53 cents per share a year earlier. Revenues rose 4.6 per cent to $16.5 billion from $15.8 billion. Merchandise revenues grew 8.8 per cent to $4.2 billion as same-store merchandise revenues -- a key retail metric for sales of existing locations -- increased 4.9 per cent in Canada, 4.5 per cent in the United States and 2.9 per cent in Europe. Road transportation fuel volumes grew 1.6 per cent with same-store road fuel volumes increasing by 0.8 per cent in the U.S., but decreasing by 1.4 per cent in Europe and by 0.6 per cent in Canada. Fuel revenues increased 3.4 per cent to $11.9 billion. The company was expected to earn $641.7 million or $1.17 per share in adjusted profits on $17.3 billion of revenues, according to analysts polled by Thomson Reuters Eikon. Alimentation Couche-Tard, which is rebranding all locations outside of Quebec as Circle K, says more than 4,900 stores in North America and more than 1,900 in Europe now display its global brand. The retail chain has more than 16,000 company and franchise operated locations, including 983 offering automated fuel stations.